Atlantis Rising Progress | NJNA is Blogging! The third and final day of my Atlantis Rising class was a bit of a disappointment. Our teacher wasn’t feeling well, so she just went through the instructions page by page and left as soon as she finished. A few people stayed through about noon to continue working on whatever threads we had hanging out. 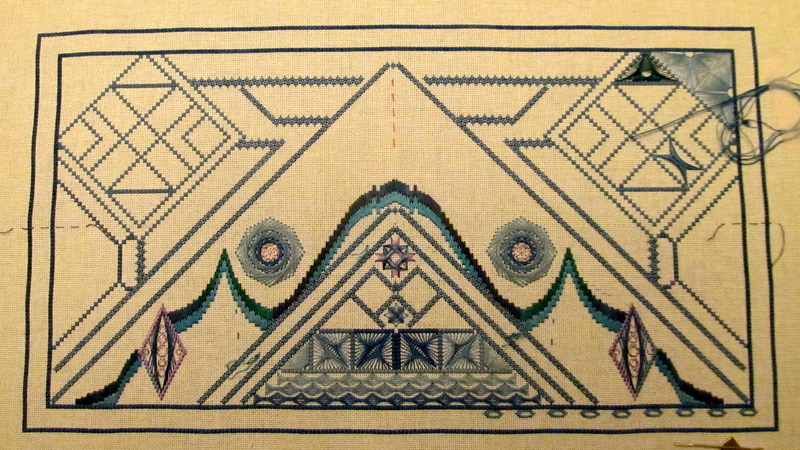 When I got home, I continued to work on the bargello portion of the project and so I was able to get a second pass in. Today, I decided to try the next “fancy” section of the design — Sprat’s Heads that fill the four square boxes in the bottom of the mountain. I ripped the first box out at least six times and after about two hours, finally, I decided to throw away the charts and just do the motif so it sorta filled and centered in the boxes. My head hurt pretty bad after all that thinking! I think I’ll do another row of bargello next and then move on to another section with fancy stitches. I helped Dottie on Saturday with the double fans (below those awful squares) and as a thank you, she fixed the scissor fob that I bought in Anaheim and then she made (!) 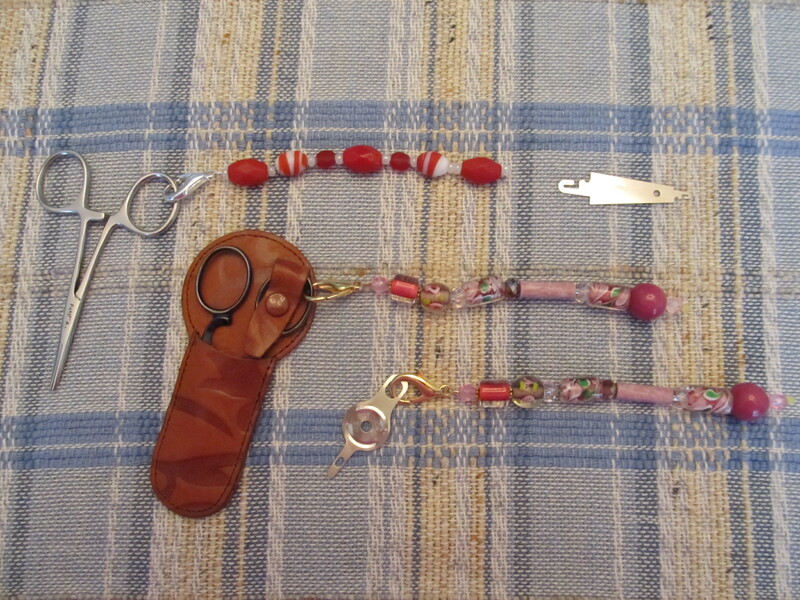 me a scissor fob and a threader fob to match my stitching supplies bag! How cool is that? The threader to the right of the red beads is the one that Dottie removed to fix the fob. It seemed like such a good idea when I saw these in Anaheim, but the threader has hooks instead of holes and the hooks got caught on everything from stitches to tablecloths to sweaters. So now the threader is relegated to my magnetic needle box and the red fob looks awfully handsome on my hemostats! All in all, I am glad that I came to take this class in person because I met so many wonderful people! I’ll definitely be back to stitch another day!